FOCUS: Studying rocks helps us to piece together the story of how the geosphere, the Earth’s rocky outer layer, has been shaped and changed over time. We’ll meet some rocks that formed by three different processes, examine some minerals we find in rocks, and look for fossils of ancient creatures. Underlying all the Earth’s land and water, rocks provide a foundation that supports the living world, gives clues about past life forms, and provides us with many materials that we use in our everyday lives. Objective: To begin to explore and ask questions about rocks and minerals. In small groups, have the children sit in a circle. Give each child a paper sandwich bag containing a small rock. Have the children feel their rock without looking at it, noticing its smoothness, texture, any irregularities in the shape, if the edges seem rounded or sharp etc. Then, on the count of three, have the children put their bag in front of the person on their right. Now have them feel the pebble in their new bag, pass again, and repeat until everyone has had a chance to feel three or four different rocks, or continue until everyone has their starting rock back again. Finally, let the children take the rock they have out of the bag to look at it. Have them set all the rocks out in front of them so everyone can admire the whole collection. Ask children for ideas about why rocks can be so different from each other. Materials: brown paper lunch bags, small rocks (from one to four inches in diameter) with different textures and shapes, one per student. STATIONS: The following three activities are best done in small groups and so could be set up as stations: Rocks Up Close, Fossil Fun, and Mineral Mysteries or Upper Grades Challenge: Testing Minerals. Objective: To examine granite, looking for the mineral crystals in it, and meet some other rocks. If available, show the children other rock samples such as those listed below. Let them feel them and look at them with magnifying lenses, noticing differences. Now read the list of characteristics below and ask the children to decide which rock fits each description. Place each rock in the appropriate box on the Rocks Up Close sheet. Afterward, show pictures of the rocks in the Rocks Up Close Chart and compare to their guesses. Materials: magnifying lenses, small granite rock samples, one per child; samples of sandstone, limestone, gneiss, slate, marble, pumice, obsidian; small dish of water to test pumice, Rocks Up Close sheet, and Rocks Up Close chart. Objective: To make a model of a fossil and view some real fossils in sedimentary rock. If available, show the children some rocks containing real fossils. Point out a few and show them a Fossil Picture Guide to help them find others. Explain that fossils are only found in sedimentary rocks. How might these imprints have gotten into the rock? (The rock must have been soft, like mud, when the animal or plant fell onto it and was buried.) If you find fossils of ancient sea animals in a desert, what does it tell you about this place in the past? (It must have been under an ocean then.) Do any of these fossils look anything like modern day plants or animals? Working in small groups, give each child a two-inch ball of craft dough. They may flatten it a little by pressing. Offer a selection of natural objects, such as seashells, nutshells, cedar sprigs, pressed leaves, etc., from which to make an imprint in the clay. Have each child choose an item and press it lightly into the dough. Carefully remove it and look at the imprint. Use magnifying lenses to study closely. Can they see any details in the impressions? Set aside to dry or bake in an oven. Materials: craft dough,* two-inch ball per child; variety of natural items to press into the dough, such as seashells, nutshells, cedar sprigs, pressed leaves, or plastic dinosaurs; rocks containing fossils; Fossil Picture Guide, magnifying lenses. Play dough recipe with baking soda and cornstarch (pure white, keeps sharp detail, bakes hard but brittle): Mix 4 cups baking soda, 2 cups cornstarch, 2½ cups water in saucepan. This recipe is gluten-free. Play dough recipe with flour and salt (off-white, very elastic, good for modeling, dries hard): Mix 2 cups flour, 1 cup salt, 4 tsp. cream of tartar, 2 tbsp. vegetable oil, and 2 cups water in a saucepan. For gluten-free, substitute 1 cup rice flour and 1 cup cornstarch for the 2 cups flour. Mix all ingredients in saucepan and cook over medium heat, stirring constantly. Cook about ten minutes, until it’s like mashed potatoes. Turn out on a plate, cover with damp cloth, and let cool. Knead until smooth, then store in airtight container. Objective: To examine samples of pure minerals, observing characteristics to identify them. Show the children samples of pure minerals. Let them feel them and look at them with magnifying lenses, noticing differences. Extra care is needed for handling mica which is flaky and brittle. Explain that geologists use some simple tests to help in identifying minerals. The samples provided are pure minerals that came from rocks. Working in small groups, have children follow these instructions for each test or quality. Magnetism: Try to pick it up with a magnet to see if it is magnetic. Luster: Note what kind of sheen the mineral has. Some minerals look metallic; others look and feel greasy; others look pearly or like glass. Color: Note color or colors. Some can be more than one color. Now read the list of characteristics below and ask the children to consider which mineral fits each description. Place each rock in the appropriate box on the Mineral Mysteries sheet. Materials: mineral specimens, magnifying lenses, ceramic streak plate, Mineral Mysteries sheet and Mineral Mysteries chart, magnet. Objective: To look for evidence of minerals present in the objects in our everyday lives. Challenge the children to find examples of minerals used in our everyday lives. Have them find examples. Metal: All metals are minerals or made from combinations of metallic minerals. Talc: Plastics, baby powder, and house paints usually contain talc. Quartz: All glass is made from quartz, and there is a tiny crystal of quartz inside clocks and watches. Magnetite: Magnetite is used in magnets and in computers and other electronics. Mica: Mica is used to make shiny paint for cars, sparkly nail polish and eye shadow, glittery designs on clothing, joint compound in walls, and roofing shingles. Gemstones: All natural gemstones are minerals. Or, bring in a collection of common household or classroom items and have children sort them into two piles, depending on whether they contain a mineral(s) or not. Afterwards, discuss the different items and correct any mistakes. Look around for other examples in the classroom. From this evidence, how important are minerals in our daily lives? Objective: To collect, measure, examine closely and compare rocks on the school ground. Take the children outside. Have children work in singly or in pairs to collect ten to twenty small rocks from around the school grounds. Provide egg cartons, berry boxes, or bags for collecting the rocks. Have them spread out the collections to study them further. Special Features: Ask the children to hold up any rocks they found with the following characteristics: stripes, speckles or patches, layers, sparkles that might be mica, white areas that might be quartz or marble, solid black or gray or another color, smooth, rough, rounded, pointy. Have everyone hold up their favorite rock! Have them use their rock rulers to measure the rocks in their collections. Are any of their rocks boulders (greater than 10 inches) or cobbles (less than 2.5 inches but less than10 inches)? Or are they pebbles (less than 2.5 inches)? Do they see any boulders nearby? Optional: challenge the children to find the smallest boulder nearby! 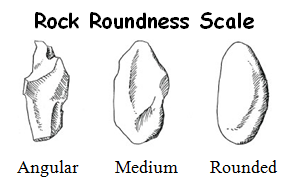 Rock Roundness (Grades 3-6): Show children the Rock Roundness Scale, and hold up an example of a rock that is rounded, angular, and medium. Now have the children line up their rocks in order, from most rounded (with smooth, rounded edges) to most angular (with sharp edges and points). They may feel the stones as well as look at them to decide. Do they have more angular rocks or more rounded rocks in their collections? Looking at all the collections, does it seem like these rocks came from far away or did most come from nearby? Could any of the rocks you find be from a local gravel pit? Materials: for each team: Rock Ruler; egg cartons, berry baskets, or other containers for collecting rocks; optional: a bucket of 50-100 pebble-sized rocks collected ahead of time in case of inclement weather; for older children: Rock Roundness Scale. Objective: To make sculptures out of small rocks found nearby. Show children pictures of a variety of rock sculptures made by artists. Have the children use the pebbles in their rock collections to make their own sculptures; build them in small groups or build one as a whole class. Afterward, take a tour to enjoy and photograph the sculptures. Materials: rock collections from Rock Hounds, pictures of rock sculptures; optional: camera. Objective: To learn three ways that rocks formed and changed throughout Earth’s history. Objective: To model the formation of igneous and metamorphic rocks from magma. Take the children outside. Explain that the class is going to act out how igneous rock forms from molten magma (melted rock) deep underground. Magma contains different minerals that were part of other rocks before they melted. As the magma cools, the minerals crystalize and it becomes a new rock. The children will be the minerals in the magma. Have the children line up and hold one hand behind their backs. Place a folded card (with one of three colors marked inside) in each child’s hand, telling them to keep it hidden and not look at it until you say to. The cards are colored to represent three different minerals. To play, have the children move in slow motion within a defined area pretending to be magma. Explain that when you say “crystallize,” everyone must look at their card, hold it up so others can see it, and then try to link up with others of the same color (without talking). They should link elbows when they meet up, and then, moving as a unit, try to link up with others of their kind. When you say “freeze,” everyone must stop where they are. Materials: tokens in three colors (such as poker chips) or small folded cards with one of three colors marked inside, one per child; gym cones. Objective: To write a fictional story about a favorite rock, describing a sequence of events in its history. Have each child pick a favorite rock from their collections to keep. From what they’ve learned about how igneous, metamorphic, and sedimentary rocks form and the agents of erosion, have them write a story about how this rock came to be in the place where they found it. They may illustrate the story as well. Afterward, in small groups, have children share their stories. Materials: paper or science journals, clipboards, pencils: optional: colored pencils. Objective: To express feelings about the uniqueness of rocks. Materials: small rocks from their collections. Be a Rock: Have children find a spot to sit with eyes closed, not touching another child. Imagine what it would be like to be a rock underground, boxed in from all sides, a huge weight of rock above and all around, connected to all the rock in Earth’s crust. Solid As a Rock: Have children act out what it’s like to be the molecules in a rock. Explain that molecules in a solid are bonded together. Have them crowd together into a tight group, touching shoulders. They can’t move around, but they can vibrate (jiggle) a bit. Have the children shake or jiggle, while remaining in a tight group.